Im using HighgFX Driver 1024x768 Workbench Screen with my Indivision AGA MKII and also installed a small fan to the Indivision as well as a heatsink ontop of the Alice chip to deal with some artifacts I was getting when the Amiga got hot. Huh. My Indivision has been staying nice and cool. I have not put a cover on my A1200 in years though. I lost my keyboard connector, so I use a PS2 kb adapter and an external keyboard. I got one of the Amiga Doom ports working on my Indivision the other day - full 320*240 with no borders. The game runs like a champ and looks great! LoneWolf wrote: Im using HighgFX Driver 1024x768 Workbench Screen with my Indivision AGA MKII and also installed a small fan to the Indivision as well as a heatsink ontop of the Alice chip to deal with some artifacts I was getting when the Amiga got hot. 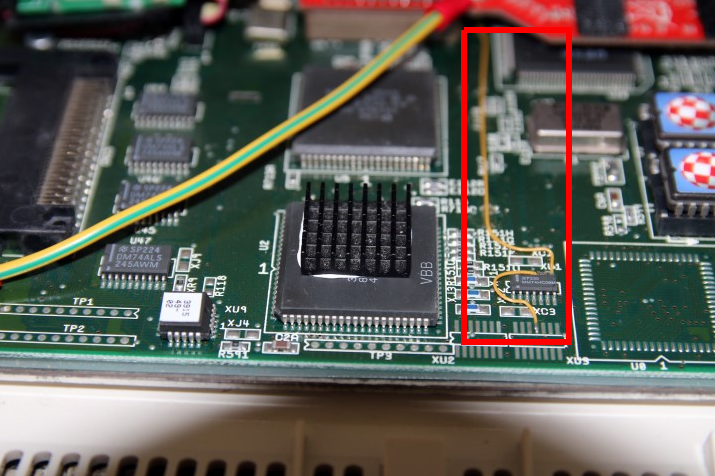 What's that single yellow wire mod on your A1200's motherboard Lonewolf? He's grounding the Indivision. This is a practice you need to follow on just about every one of Jens' amiga enhancements as well as the Furia on the 600. Oops! Didn’t even see that one. That certainly doesn’t look familiar to me. Most likely a rework wire done at the factory. My 1200 has the same repair. Have you tried tweaking the vertical scaling, using for the actual monitor settings?